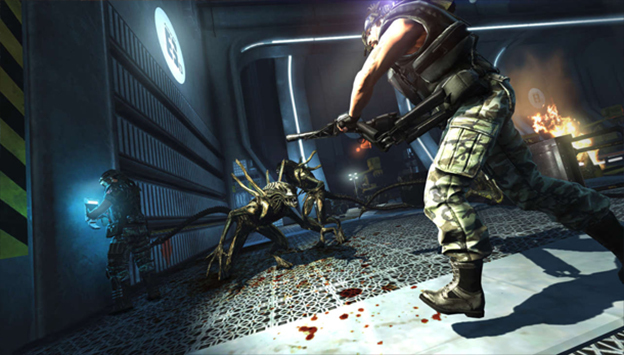 Everybody remembers the public relations disaster that was Alien: Colonial Marines, right? It's enough to make you feel bad for the folks at The Creative Assembly, who have the dubious distinction of following that game's act with Alien: Isolation. Fortunately, the studio, best known for developing the Total War series, is making an extremely different game. Isolation isn't a shooter, it's a deadly survival game of hide and seek between a one woman and one terrifying Xenomorph. Set fifteen years after the events of the original Alien movie, the game stars Ellen Ripley's daughter Amanda, who is being sent to the remote space station Sevastapol in search of a black box that contains information about her mother's disappearance. Of course, the station has already been infested by the very extraterrestrial menace that stalked the elder Ripley, and Amanda must find a way to survive the creature's hunt. 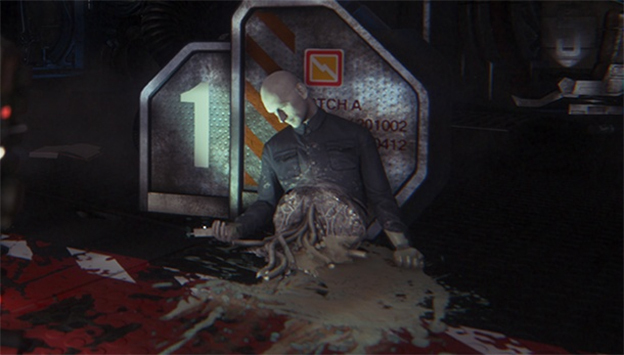 That's right, there's only one Alien in this game—a nine-foot monstrosity that can't be killed. Instead, Amanda will have to use her wits and her stealth skills to avoid being dinner for this deadly predator. 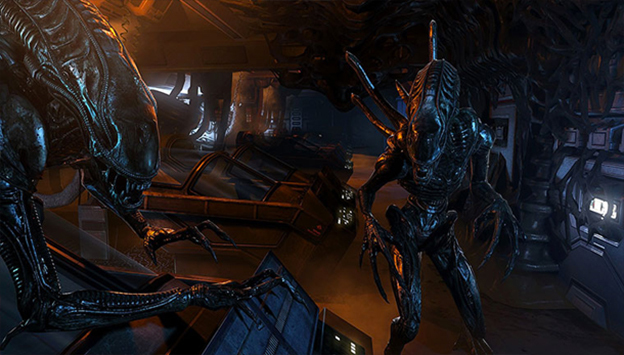 This experience is meant to recreate the feeling of the first Alien film rather than the more action-packed sequel Aliens, upon which previous games in the franchise were based. 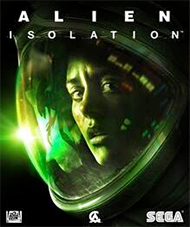 The game's developers claim that the Alien isn't on a scripted path, but uses a complex artificial intelligence program to track Amanda (and presumably NPC humans) and hunt her down. It will respond to the light of her flashlight and the sound of her feet if she runs. It will also investigate the area if it finds open doors or other objects that have been tampered with. If it gets too close to a hiding place that Amanda has found, there's even a trigger that the player can use to have her hold her breath in order to avoid detection. The Alien will make different kinds of sounds depending on what it's currently doing, so smart players will learn to recognize these sounds in order to determine the next best course of action. Amanda isn't completely helpless, and although she can't kill the Alien, she can slow it down. She'll also have to directly fight the occasional hostile human or robot. The game features a crafting system that will let Amanda create simple weapons and traps from items she scavenges around the space station. She'll need to vary her approaches, though, because the Alien supposedly learns from experience. Much of the time, the motion detector will be Amanda's best weapon, allowing her to keep tabs on the Alien's general area in order to try to sneak past or avoid it. Even that, however, has its limits. If the alien isn't moving, it will be ineffective. It will also be difficult to look at the detector and the environment at the same time thanks to a blurry visual effect provided by the fiendish developers. There are sure to be some, “where is it... where is it... oh god it's RIGHT HERE!” moments thanks to this. The Creative Assembly has gone to great pains to pay homage to the 1979 film, studying the original set and prop design in order to recreate the era's “low-fi sci-fi” look. The team was given access to the movie's original score, emulating and expanding upon it to fill the game with the same musical atmosphere. There's even a bit of a film grain look to the graphics. It certainly seems to be the kind of Alien experience that fans of the first film can appreciate. Character design was obviously inspired by the first Alien film as well. Amanda Ripley looks tough and determined like her mother, and it's great to see a game development team honor that part of the franchise's legacy. We don't know a lot about the other characters in the game, but their designs make them look like people with interesting personalities. Just don't expect them to survive for very long. Alien fans were bitten hard by Colonial Marines, a game that promised much but was ultimately disappointing. This game looks on the surface to be much more true to the franchise, in particular the look and spirit of Ridley Scott's original movie. There are still plenty of unknowns, though, including how the game will be kept interesting and move the player through a story with an unscripted Alien foe. Will the enemy AI be all it's cracked up to be? If the answer is yes, we could finally have the Alien game that the movie franchise deserves, as well as a pee-your-pants scary gaming experience. Improvise to Survive: Hack systems, scavenge for vital resources and craft items to deal with each situation. Will you evade your enemies, distract them or face them head on?